Leading manned Mars Expedition designs to a common scale (the orange bar represents 100 m). Upper left: Von Braun, 1948-1956; top middle, NASA EMPIRE, UMPIRE; Stuhlinger 1962; Bono Deimos; middle, NASA TRW, MPRG, IMIS, 1965-1971; upper right, STCAEM, SAIC, Design Reference Missions, 1983-2001; bottom rows, Russian designs, 1956 to 1986; below orange bars, Russian and American solar-electric designs. 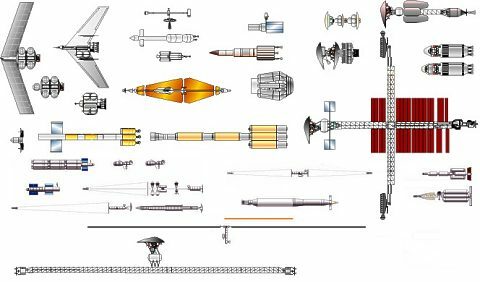 Since Wernher von Braun first sketched out his Marsprojekt in 1946, a succession of designs and mission profiles were seriously studied in the United States and the Soviet Union. By the late 1960's Von Braun had come to favor nuclear thermal rocket powered expeditions, while his Soviet counterpart Korolev decided that nuclear electric propulsion was the way to go. All such work stopped in both countries in the 1970's, after the cancellation of the Apollo program in the United States and the N1 booster in the Soviet Union. Work resumed in the 1980's, led in America by private advocacy groups, and in the Soviet Union by Glushko, who saw the new Energia heavy-lift booster as the means of reaching Mars. In the late 1980's there was even a brief 'Race to Mars', with both sides putting forward designs. This unexpected revival of the space race ended with the collapse of the Soviet Union and the scrapping of the Energia booster. Despite press enthusiasm, such a project never had any high-level political support in either country. Von Braun Mars Expedition - 1952 American manned Mars expedition. Study 1952. Wernher von Braun made the first engineering analysis of a manned mission to Mars in 1948. Von Braun Mars Expedition - 1956 American manned Mars expedition. Study 1956. Von Braun's Mars expedition presented in the 1956 book he co-authored with Willy Ley, The Exploration of Mars, was vastly reduced in scope from the 1952 version. MPK Russian manned Mars expedition. Study 1956. This first serious examination in the Soviet Union of manned flight to Mars was made by M Tikhonravov. Stuhlinger Mars 1957 American manned Mars expedition. Study 1957. In 1954 Ernst Stuhlinger conceived the first Mars expedition using solar-electric propulsion. TMK-E Russian manned Mars expedition. Study 1960. Feoktistov felt that the TMK-1 manned Mars flyby design was too limited. His design group proposed in 1960 a complete Mars landing expedition, to be assembled in earth orbit using two or more N1 launches. TMK-1 Russian manned Mars flyby. Study 1959. In 1959 a group of enthusiasts in OKB-1 Section 3 under the management of G U Maksimov started engineering design of this first fantastic project for manned interplanetary travel. Bono Manned Mars Vehicle American manned Mars expedition. Study 1960. In 1960 Philip Bono, then working at Boeing, proposed a single-launch Mars manned expedition. Bono's scenario was the classic trade-off of weight for risk. Mars Expedition NASA Lewis 1960 American manned Mars expedition. Study 1960. The first NASA study of a manned Mars expedition outlined an opposition-class, nuclear thermal rocket powered spacecraft that would take seven astronauts to the planet's surface for 40 days. EMPIRE Aeronutronic American manned Mars flyby. Study 1962. Aeronutronic's Mars flyby spacecraft design of 1962 had a total mass of 170 metric tons and would be launched into low earth orbit with a single launch of a Nova booster. EMPIRE Lockheed American manned Mars flyby. Study 1962. Lockheed's manned Mars flyby spacecraft design of 1962 had a total mass of 100 metric tons. EMPIRE General Dynamics American manned Mars flyby. Study 1962. General Dynamics' manned Mars orbiter spacecraft design of 1962 had a total mass of 900 metric tons and would be launched into low earth orbit with a two launches of a Nova booster or eight launches of a Saturn V.
Stuhlinger Mars 1962 American manned Mars expedition. By 1962 Ernst Stuhlinger's ion-drive Mars expedition had evolved within the Research Projects Division into five 150 m long spacecraft, housing a total crew of 15. A much shorter 475 day mission time was planned. Faget Mars Expedition American manned Mars expedition. Study 1963. NASA Houston supported a conference in May 1963 which examined a number of Mars expedition scenarios. Mavr Russian manned Mars flyby. Study 1963. A variation of the TMK-1 scenario by Maksimov's unit would still use a single N1 launch. However a flyby of Venus would be undertaken on the return voyage from Mars. TRW Mars American manned Mars expedition. Study 1963. In 1963 TRW designed a Mars expedition using aerobraking at both Mars and Earth, and a swing-by of Venus on return. Project Deimos American manned Mars expedition. Study 1964. Project Deimos was a Mars expedition proposed by Philip Bono in the mid-1960's. It would use the huge Rombus single-stage-to-orbit booster, refueled in earth orbit, as the propulsion system to Mars and back. UMPIRE Convair American manned Mars expedition. Study 1964. Unfavorable Manned Planetary - Interplanetary Roundtrip Expedition profiles were studied under NASA Huntsville contracts to General Dynamics and Douglas in June 1963. UMPIRE Douglas American manned Mars expedition. Study 1964. Unfavorable Manned Planetary - Interplanetary Roundtrip Expedition profiles were studied under NASA Huntsville contracts to General Dynamics and Douglas in June 1963. MORL Mars Flyby American manned Mars flyby. Study 1965. Near-term manned Mars flyby spacecraft proposed by Douglas in 1965 for flight as early as 1973. KK Russian manned Mars expedition. Study 1966. Work on the TMK project continued, including trajectory trade-off studies and refinement of the design. FLEM American manned Mars expedition. Study 1966. IMIS 1968 American manned Mars expedition. Study 1968. In January 1968 Boeing issued a report that was the result of a 14 month study on manned Mars missions. Von Braun Mars Expedition - 1969 American manned Mars expedition. Study 1969. Von Braun's final vision for a manned expedition to Mars was a robust plan that eliminated much of the risk of other scenarios. Two ships would fly in convoy from earth orbit to Mars and back. MK-700 Russian manned Mars flyby. Study 1972. Chelomei was the only Chief Designer to complete an Aelita draft project and present it to the Soviet government. MEK Russian manned Mars expedition. Study 1969. The Mars Expeditionary Complex (MEK) was designed to take a crew of from three to six to Mars and back with a total mission duration of 630 days. Mars 1986 Russian manned Mars expedition. Studied 1978-1986. NPO Energia resumed study of a Mars project once development began of the new Energia booster in place of the cancelled N1. NASA Mars Expedition 1971 American manned Mars expedition. Study 1971. Final NASA Mars expedition before the 1980's. The spacecraft would use shuttle hardware, including SSME engines in the rocket stages. Mars via Solar Sail British manned Mars expedition. Study 1982. In 1982 a minimum-mass approach to a Mars expedition was proposed, using aerocapture at Mars and the use of a long-duration solar sail cargo transport. Planetary Society Mars Expedition 1983 American manned Mars expedition. Study 1983. Chemically-powered Mars flyby-rendezvous landing mission designed by SAIC under contract to the Planetary Society in 1983. Case for Mars II American manned Mars expedition. Study 1984. The Case for Mars II Mars expedition plan was presented at a conference on 10-14 July 1984. Lagrangian Interplanetary Shuttle Vehicle American manned Mars expedition. Study 1985. A Lagrangian approach to Mars exploration was proposed in June 1985. This would use the L1 sunward point of equal Earth/Moon/Sun gravity to assemble and refuel a large Interplanetary Shuttle Vehicle spacecraft. Pioneering the Space Frontier American manned Mars expedition. Study 1986. In 1984 a National Commission on Space was formed, with ex-NASA Administrator Thomas Paine at its head. Ride Report American manned Mars expedition. Study 1987. Former astronaut Sally Ride was asked to head a task force to formulate a new NASA strategic plan in August 1986. Mars Evolution 1988 American manned Mars expedition. Study 1988. In 1988 NASA made four case studies of a rapid response to the threat of a Soviet manned expedition to Mars. Mars Expedition 88 American manned Mars expedition. Study 1988. In 1988, in response to a perceived Soviet plan to start a new space race to Mars, NASA made in depth case studies of a rapid US response. Phobos Expedition 88 American manned Mars expedition. Study 1988. Human Expedition to Phobos was one of four in-depth NASA case studies in 1988 in response to a perceived imminent Soviet manned Mars program. 90 Day Study American manned Mars expedition. Study 1989. Following the Ride Report, the Bush administration indicated a willingness to support a new manned space initiative after completion of the space station. Mars 1989 Russian manned Mars expedition. Study 1989. In 1989 yet another Mars project was proposed by NPO Energia. Mars Evolution 1989 American manned Mars expedition. Study 1989. In 1989 NASA's Mars Evolution case study examined one approach to develop a permanent, largely self-sufficient Mars outpost with significant scientific research capability. Mars Expedition 89 American manned Mars expedition. Study 1989. The primary objective of the 1989 Mars Expedition case study was to determine how to accomplish a single human expedition to the surface of Mars as early in the 21st century as practical. Mars Semi-Direct 1991 American manned Mars expedition. Study 1991. Mars Semi-Direct was a NASA concept bridge between Zubrin's Mars Direct and NASA's Design Reference Mission 1.0. It was essentially a low-cost version of Boeing's STCAEM. Mars Direct American manned Mars expedition. Study 1991. In 1991 Martin Marietta and NASA Ames (Zubrin, Baker, and Gwynne) proposed 'Mars Direct' - a Mars expedition faster, cheaper, and better than the standard NASA plan. STCAEM Cryogenic Aerobrake American manned Mars expedition. Study 1991. The STCAEM cryogenic / aerobrake (CAB) concept was used as the NASA reference vehicle. STCAEM NEP American manned Mars expedition. Study 1991. STCAEM SEP American manned Mars expedition. Study 1991. The solar electric propulsion (SEP) Mars transfer concept was the only non-nuclear advanced propulsion option in the STCAEM study. STCAEM NTR American manned Mars expedition. Study 1991. Synthesis Study American manned Mars expedition. Study 1991. On 11 May 1991 President Bush declared that he would support a Space Exploration Initiative program leading to a Mars Landing by 2014. ERTA Russian space tug. Study 1992. ERTA (Elecktro-Raketniy Transportniy Apparat) was a nuclear-electric space tug designed to be boosted on medium boosters and provide both propulsion and electrical power for unmanned planetary probes. Design Reference Mission 1 American manned Mars expedition. Study 1993. The Design Reference Mission 1.0 was the Space Exploration Initiative's last gasp. Mars 1994 Russian manned Mars expedition. Study 1994. Soviet / Russian design for a Mars expedition powered by RD-0410 bi-modal nuclear thermal engines. A crew of five would complete the trip to Mars and back in 460 days. Mars Together Russian Mars orbiter. Study 1994. In 1994-95, RKK Energia, and NASA's Jet Propulsion Laboratory analyzed the project 'Mars Together'. Athena Mars Flyby American manned Mars flyby. Study 1996. In 1996 Robert Zubrin proposed a new version of a manned Mars flyby mission, dubbed Athena. Design Reference Mission 3 American manned Mars expedition. Study 1996. This July 1997 DRM was a subscale version of the original, with a scrub of the original payloads to reduce mass wherever possible. Combo Lander Mission American manned Mars expedition. Study 1998. During the spring of 1998, NASA conducted a special study to design a human Mars mission that could be accommodated for launch by three heavy-lift launch vehicles. Design Reference Mission 4 SEP American manned Mars expedition. Study 1998. In 1998 NASA Lewis studied a Solar Electric Transfer Vehicle for use in a Mars Expedition. This would never leave earth orbit yet provide most of the delta-V to send a spacecraft toward Mars. Design Reference Mission 4 NTR American manned Mars expedition. Study 1998. The design reference mission 4.0 took into account all of the changes in payload masses as a result of further study of individual elements. Dual Lander Mission American manned Mars expedition. Study 1999. After some discussion within NASA, in the Combo Lander mission was found to be too lean. Mars Society Mission American manned Mars expedition. Study 1999. In 1999 the Mars Society, noting certain defects in NASA's Design Reference Mission, requested California Institute of Technology to develop an alternative scenario to meet these concerns. Marpost Russian manned Mars expedition. Study 2000. In December 2000 Leonid Gorshkov of RKK Energia proposed a manned Mars orbital expedition as an alternative to Russian participation in the International Space Station. European Mars Mission European manned Mars expedition. Study 2005. In 2005 the Mars Society Germany proposed a European Mars Mission (EMM) that could be launched using an improved version of the Ariane 5 booster. Mars Oz Australian manned Mars expedition. Study 2006. 2001 design study by the Mars Society Australia that incorporated many innovative elements to produce a minimum-mass non-nuclear Mars expedition concept.